Poole Dermatology (Metairie) - Book Appointment Online! 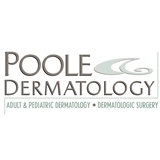 Poole Dermatology would like to welcome you to our practice. Our goal is to provide each one of our patients with high quality, personalized and compassionate care for all your dermatology needs. Our range of services include adult and pediatric general medical dermatology, dermatology surgery and skin cancer surgery, and the latest advances in cosmetic and laser procedures. All the staff at Dr. Poole's office are exceptional. I have been seeing Dr. Poole for at lease five years and consistently they impress me with there professionalism. Unfortunately, I do have skin challenges of different levels and so I have to visit the office every six months. My point is this visit isn't necessarily always a pleasant experience from a medical standpoint. However, The receptionist, Dr. Poole's assistant Heidi, and everyone else are always very nice and professional. I'd highly recommend this doctor and his office staff.